Love Soccer? Hate being Fat? You've come to the right place. If you need weight loss motivation to win your battle against fat then you're in the right place. We want to support you for every single kilo you need to lose until you win your battle against fat. Ready? MAN v FAT Soccer is for overweight and obese men of any fitness level - every player is in the same situation and wants the same thing. Players join a 6 a-side soccer team and play a match each week, but uniquely, their team's position in the league is decided not just by goals scored on the pitch, but also by weight lost each week. Realising that most weight loss programs just weren't working for men, the UK founders of the program opened the first MAN v FAT league in January 2016. Just over two years later, there are now over 50 leagues and 4,500 men involved across the UK, and together they've managed to lose over 50,000kg! If you're a man who has a BMI of 27.5 or higher (you can check your BMI here) then you're eligible to join one of the Australian MAN v FAT leagues; the first MAN v FAT leagues anywhere in the world outside the UK! Be the first to know! Sign up to the UWA MAN v FAT Soccer mailing list by clicking here. Losing weight is tough, and doing it on your own can be almost impossible. But, you're not alone - over 70% of Australian men are overweight or obese. 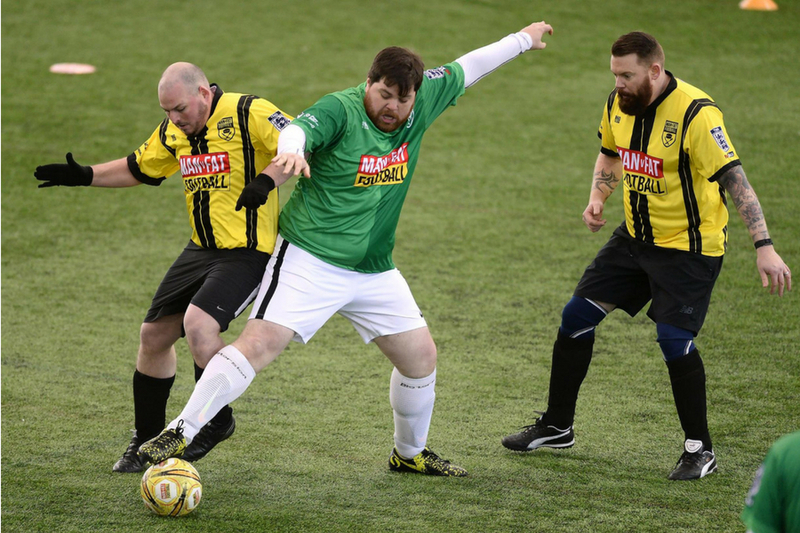 MAN v FAT Soccer means you don't have to do it on your own. Every week, you'll get together with your team mates to play a 30-minute game of soccer. But it doesn't end there - in MAN v FAT Soccer leagues, you score goals for your team on the pitch (the traditional way) as well as off it - by losing weight in the week between matches. Not only that, you're surround by men just like you, who want to lose weight and have fun while they do it. And you get loads of help, including expert advice from your league coach, a dedicated website and player handbook, and support from guys on your team. Based on a 14-week pilot scheme run at UWA in 2018, players lost 7kg on average and 95% of players lost weight, totalling 515kg across the league! But the benefits don't stop at weight loss – our participants are sleeping, eating and feeling better through taking part in MAN v FAT Soccer. Click here to meet players from the 2018 season at UWA.